General Assembly of the Social Platform, in L42 (Centre for events and congresses), Brussels, 27th of April 2017. 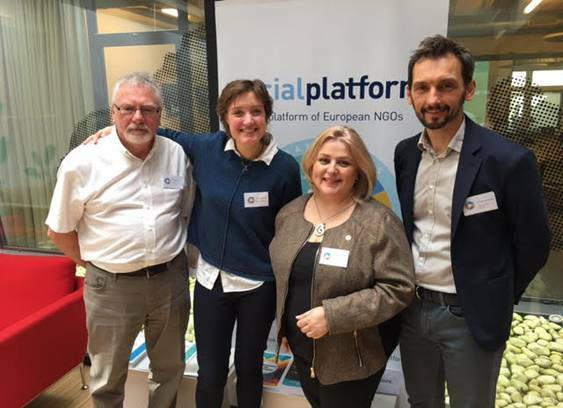 Ana Lima has attended in representation of IFSW Europe to the General Assembly of the members of the European Social Platform of NGOs, an European event in which not only it was the meeting of representatives of the different member associations of the Platform, also relevant topics were discussed, and working groups were held to help to shape future working paths. Among other topics, the approval of the documents accepted yesterday by the European Commission in “Social Pillar”, and current issues such as the sustained increase of Poverty, or strategies and policies of social inclusion and support to the immigrants. In a way of conclusion some feedbacks from the groups were transferred to Ann Mettler (Head of the European Centre for Political Strategy (EPSC) since 2014, and former Executive Director and co-founder of the “Lisbon Council” from 2003 to 2014), a Brussels-based think tank and policy network. Ann Mettler has opened a possibility for the representatives of the Platform, to contribute with their ideas and to clarify the points of interest treated in the following working groups. The debate has dealt with the challenges that Europe has to face, to which Ann solemnly responds in the line of how difficult it is not only to elaborate, but one day to “maintain” social policies in the Levels Quality, consensus and progress. Comparing Europe with a much deteriorated global public policy framework, not forgetting that “not all states have maintained and elaborated their public policies in the right way” and in favour of an “assured future”. Judgment that proves the social understanding required to face a difficult sustainability, with Ann’s requesting to the Platform “to accept that there are people who have another vision of what is or isn’t really important in sustainability”. The time of all attempts to understand, respect and try to achieve “sustainability” from an open multiplicity of opinions. Ann Mettler was “opening the door to the Social Platform to help the EPSC in matters of more sustainable public policies, and establishing contact routes”. Ann ended up asking for the Social Platform’s assistance in terms of social policies and possibilities for future collaboration. 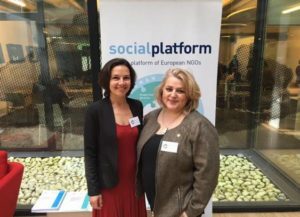 Ana I. Lima, as President of the International Federation of Social Workers (IFSW Europe), and jointly to Ian Johnston as IFSW Europe’s External Representative at the European Social Platform of NGOs, both have voted for the posts of chair, vice-presidency, treasury and three “ordinary members”. A day of testing in the establishment of new contacts, new lines of work and participate in the current European social reality.